My two younger sisters are on their college breaks right now so they are at home with our parents doing normal college kid summer break stuff. Well, I take that back. Normal college kid break stuff is drinking, tanning, and short meaningless relationships with cute surfer boys. My sisters, on the other hand, woke up at the crack of dawn this morning to go milk goats with our mother. For the record, we are not a “farm family.” The closest we have come to “farm life” was when my sisters and I got baby ducks for Easter one year. We had them for a few weeks and then realized that owning livestock in a suburb of Washington, D.C. just wasn’t realistic. Also they pooped way more than we were prepared to deal with. My non-farming parents live in South Tampa, aka one of the plastic surgery capitals of the United States. My family is not into plastic surgery or elitist stuff either. I guess we are somewhere in between cattle herding and botox. When my mom told me a few weeks ago that she picked up a part-time job milking goats, I couldn’t hold in my laughter. I LOVED the idea of it. 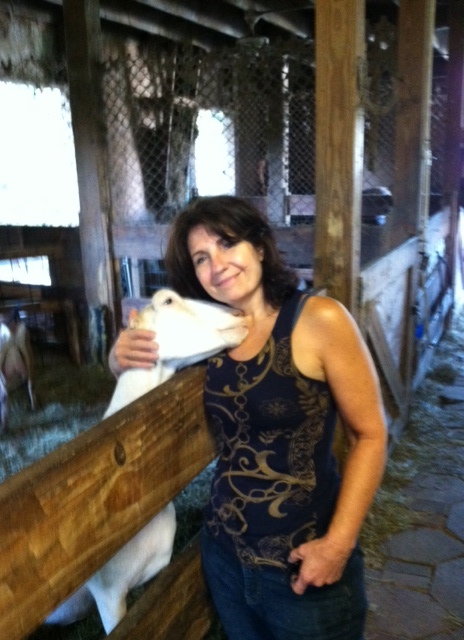 My family loves all sorts of animals, so why not milk goats in your spare time, mom? Clearly, my mom’s milking skills are appreciated by the locals. I may start calling her “the teat whisperer” for as long as I can get away with. After milking goats all morning, my sisters helped my mom clean out and organize her den. It is filled with boxes of old pictures, schoolwork, and childhood memories. 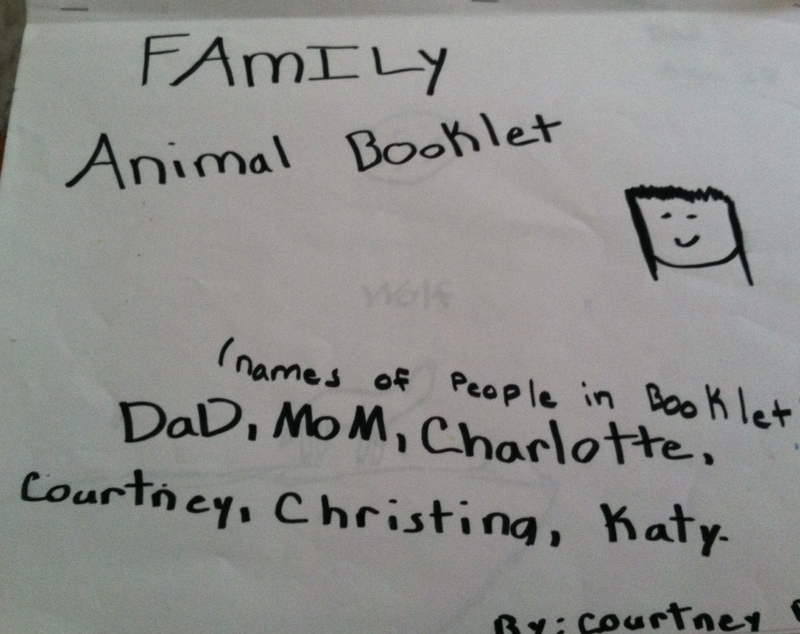 Today, my sister Christina sent me pictures of one of my childhood masterpieces titled “Family Animal Booklet.” At first I assumed it was probably a school assignment, but I know better. I was always in La-La land as a child and secretly wished I lived in a family of wolves. Sometimes I pretended that I was an orphan and was being raised by Orangutans. The Jungle Book Movie was pretty much my ideal life, as a 9-year old. So here you have a it. 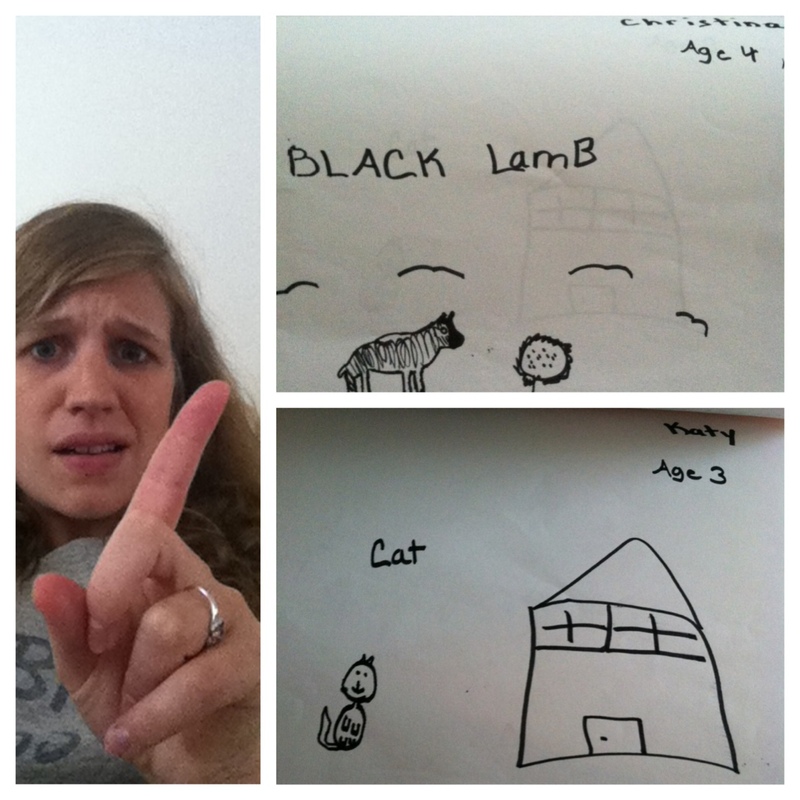 A scary glimpse into the psyche of a 9-year old who wishes her family members were animals. I am really interested in psychology, especially child psychology, so I stared thinking about what the pictures symbolized. I’m no doctor, but I have a feeling my drawings would pass the “is my child depressed and/or being abused?” test. I drew my dad as a wolf, howling at the moon. To adult me, that says I felt he was a strong leader, and protective. I drew my mom as a fox in a hole caring after her pups and sheltering them from the rain. Not much explanation or “reading into” needed there, good job mom. As for the drawings of my sisters, I have no idea. 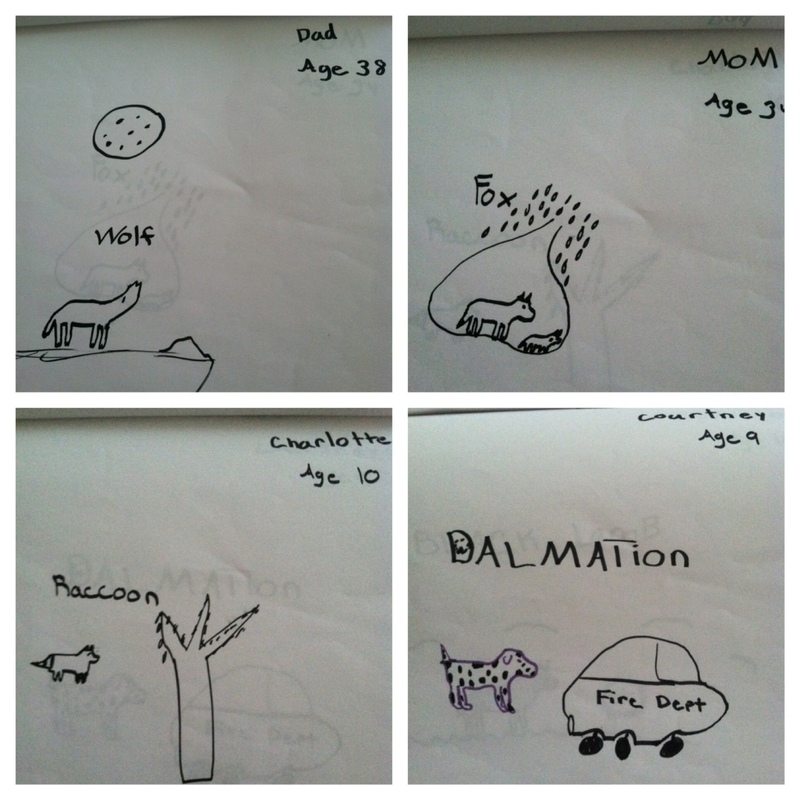 I’d like to think that the raccoon drawing of my older sister, Charlotte, means more than the 9-year old me viewing her as a trash eating mongrel, but we weren’t the closest of sisters at that age. The fact that I drew her floating in the air shows that I viewed her as important and superior to myself (I do remember that from Psych courses!). All joking aside, I’m really curious as to why I made Christina not just a lamb, but a black lamb. She was a sweet kid, so there would have been no reason to make her black out of spite, and she definitely isn’t African American. Any child psychologists out there have any ideas? Katy, sweet baby Katy, was a cat. She was only 3 years old and was the cutest little thing you’ve ever seen. We would sometimes feed her milk from a bowl, food off the ground, put her on a leash, and pretend she was our kitty. She seemed to enjoy it, so it wasn’t exactly sibling abuse, right? Thanks to my sisters for sending me the “Family Animal Booklet” images and for NOT posting all of my awkward childhood pictures that I’m sure you are discovering online. I owe you one. Aw thanks, Dad! Okay so that makes sense as to why I made Chrissy a lamb, but still not too sure about the black part 😀 Aren’t you glad I made you into a wolf and not a turtle or pig or something?? You’re welcome. Love you! Oh my goodness I love this SO much!!!! The teat whisperer cracks me up and I think your mom would be similar to snow white with animals. Who wouldn’t love her?! Now on to this booklet, holy cow is that awesome!! Raccoon and black lamb are very curious choices for those girls! I would love to know about the psychology behind them!! Thank you so much for the laughs! Love it!! I can’t wait to see the drawings of Nollie and G someday soon!